PARENTING WHEN YOU’RE OLDER DOESN’T MAKE IT ANY EASIER THAN IF YOU’RE YOUNGER. Yes, I’m a 40 year-old dad with a 3-year-old toddler, a career I love, zero debt, mortgage free and ability to offer experiences to our son that I didn’t have. This wasn’t the way I had envisioned parent-hood to be but it was the way it turned out for us and we’re surviving just fine. Being financially stable has nothing to do with getting pregnant and everything to do with surviving and never giving up. There are couples out there reading this who are struggling or struggled in the past to get pregnant after many miscarriages and NO results on a pregnancy test. There are also couples who have different parenting styles which may or may not make them “cool parents” but that’s not what parenting is about. There’s more to sharing your heart than all the money in the world. Related: Do Dollar Store Pregnancy Tests Work? Whether you are working or not becoming parents means that you must provide for your child in any way you can. Often this may lead parents to seek support from family, friends and the government system when available. When I was growing up as a teenager it wasn’t uncommon to have friends announce they were having a baby. It’s a special time when anyone announces a pregnancy whether intended or not. Many people find out they are pregnant after taking precautions and are faced with parenthood when it may not be the right time in their lives. I was witness to a few friends who struggled with money after getting pregnant and having to live on government assistance. \There was no extra money to put their kids in after-school activities yet they were just as important as the parents who could afford it. The key is to find things that the family can do by spending little to no money. Finishing University was everything to me and having a sister who married very young with kids meant I knew that parenting was not on my immediate bucket list. Don’t get me wrong I enjoyed being called uncle and watching them grow up but I wasn’t ready, at least not yet. Money was always on my mind. As a guy we are conditioned to be the breadwinner in the family even though this role has changed exponentially over the years. More fathers are stay at home dads where their wives are back in the workforce months after giving birth. I wanted to be that guy who had all his T’s crossed and I’s dotted before considering marriage and starting a family. In other words I frightened myself away because I believed that a stable job and healthy savings account came before women and kids. I didn’t want to be that looser boyfriend with no career or money to support a family. As we walk down the road we will always be faced with obstacles that we need to overcome. It is possible. Fast forward 20 years and I’m now 40 and my views on starting a family earlier in life vs later in life have changed slightly. My wife faced with health issues and myself trying to finish school and get established in Canada took a toll on our start to parenting. We kept putting it off because there was always a reason why it wasn’t the right time. When it became what we considered the right time, it never happened. Both of us were working earning over 6 figures annually and after failed attempts of getting pregnant we asked our doctor for help. Since Mrs. CBB was over 35 years old she was no longer given birth-control because she smoked. Surely we would get pregnant if we just went along with our business and see what would happen. It was supposed to be fun times which turned into months and then years of failed pregnancy tests. Something was wrong and we needed to find out. After consulting with our doctor who referred her for testing we were both shocked to find out that we were never going to have kids. Somewhere along the line something went wrong and both of her tubes were blocked. All this tube talk was new to me and after much research it became clear that we may never become parents unless we adopted. We were both fine with that, at least in the moment we were both crying. That was a hollow moment in that cold stairwell holding my wife knowing how badly she wanted to be a mom. She started saying that maybe she should have gotten pregnant when she was younger and healthier and maybe this wouldn’t have happened. It turned into a very depressing dark time for her until a glimmer of hope was sent our way. Well, a 0.1% glimmer which is almost as slim as winning the Lotto Max jackpot. After a second opinion through a fertility clinic and going through the costs of the process of the In Vitro fertilization (IVF) procedure. Even with government grants the costs blew us away. At the time if both tubes were diagnosed closed I believe we were offered $2500 off the $11,000 (IVF) procedure. We had no benefits that would cover any type of IVF treatments so everything was to be paid out-of-pocket. With IVF we were also told that it’s possible to have more than one child which meant we had to consider whether we had the money to pay for twins. Looking back we knew the money wasn’t the biggest issue in having a child it was simply getting pregnant. After the fertility doctor examined Mrs. CBB he wanted to look deeper into my wife’s last diagnosis of dual blocked Fallopian tubes. As a shock to both of us we found out that she had a fibroid that needed removing (which he did) AND one of the tubes was NOT blocked. Holy happy dance. Are you messing with us? He had to be because we just went through the grief of being told we’d never conceive. This was great news in the moment until he gave us the statistics of becoming pregnant was as slim to none. At our age and with one tube open we’d have to hit 3 gold bars to see a YES on a pregnancy test. Our odds of getting pregnant were 0.1% which didn’t leave us much hope at all. After a review in the doctor’s office and this news he reminded us of the costs of IVF and the impact it would have on my wife’s body emotionally and physically. It was at that point where we decided that we wouldn’t get the IVF treatments and that if were to become pregnant so be it. We were at a time in our lives where Mrs. CBB was battling another painful health journey and wasn’t sure she had the strength to go through IVF and that was that. “What will be will be”, she said as we walked out of the office never to return. Not even two months later just before turning 39 she found out she was pregnant something that she had not even considered to be possible. After diligently tracking her menstrual cycle we just let it be because hope was all we had left. It was during the hustle and bustle of the Christmas holidays when everything changed for her, for us because we found out we were pregnant. There must have been angels watching over her because the best miracle of all shocked us, a baby boy was on the way. We kept it pretty hush-hush too for fear something might happen as she was a high risk pregnancy. Fast forward 3 years and our lives have obviously changed but what hasn’t changed was our desire to become parents when we had our financial house in order. We realize now that there is no special time to get pregnant whether you are younger or older because the odds may always be against you. When you find yourself in a pregnancy situation whether planned or not your financial obligations and priorities WILL change. Since Mrs. CBB became a stay-at-home mom I’ve secured my retirement job in a role I don’t plan on leaving and earn 6 figures plus on my own now. Even though we are debt free we still run a tight financial ship. Why? because anything could happen at any time. There hasn’t been a time since our son was born that we didn’t budget and track the expenses involved. What we’ve realized is that we were able to save lots of money by being money mindful parents. Pregnancy should not change the way you tackle your savings either. If we had gotten pregnant earlier we’d still have to do all the above with a lowered income and possibly paying for child-care costs had Mrs. CBB went back to work. There is no right or wrong time to have a baby because everything will fall into place as it should whether it happens now or in the future. You may even find out like we did that you might never conceive for reasons beyond your control. 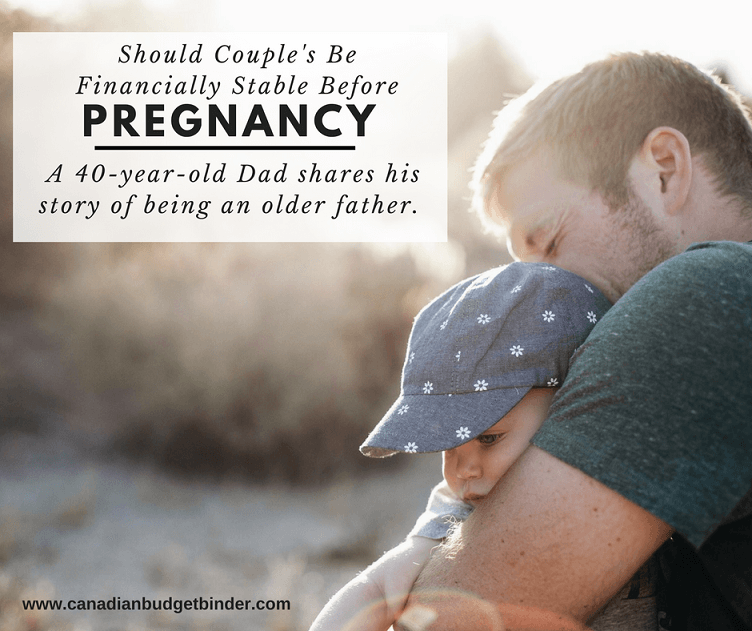 So do you really need to be financially stable to have kids? Yes and no because there are resources in Canada to help parents with basic living expenses, food banks and plenty of other ways to save. This should never be the reason to get pregnant though because it’s far from easy. Ideally working and earning a living has it’s benefits and downfalls depending on your career and income as does having an emergency savings with little to no debt (not including mortgage). Reality though is that for everyone this will always be a life-time battle with rising costs and taxes in Canada. Whether you want to become a parent or not it’s always a good idea to consider that when you are ready doctors may tell you that it may never happen. Looking back we could have started a family earlier than we did and still provided for our child the same. Had we considered getting pregnant as we turned 30 we may have caught the Mrs. problem at an earlier stage. The only difference now is that our friends who started young have kids in University where we are singing children’s songs and watching cartoons at 40. Cue…(The wheels on the bus go round and round, round and round) It’s actually kind of fun letting loose and doing all this kid stuff something I may have been shy about when I was younger. Now I just don’t care if I look like a goof if I’m loving life. We surely wouldn’t have the financial status we have today but that really doesn’t matter if living a minimalist life is no big deal. Parenting is about making choices and sometimes that might mean not being able to participate in something or having to save cash for everything. Either way money will get in between what you can and can’t do but in most cases both can be done regardless. A few moms we know couldn’t afford the costs of putting their toddlers in soccer (close to $250) so they created a soccer practice every week for the kids so they too could play and learn. They may not have had matching uniforms but who cares. At that age it’s more about soccer basics and working with other kids towards a common goal, scoring one. Possibility of a Lowered percentage pregnancy success and other health concerns. Everyone is different whether they are teen parents or in their 20’s, 30’s, 40’s+ and pregnant. There may be more money on the table to use when you get older but we do the same things other parents do who are half our age. Age doesn’t mean you will be richer, poorer or in good/health. It’s just a number but how it affects you as a parent becomes personal depending on the time in your life. Life doesn’t always dish out what we want but what we can do is embrace what we do have and run with it. There is nothing stopping you but you when it comes to making decisions. Do what feels right and when things take unexpected turns you do what you can to keep up with challenges you’re faced with. This is life my friends and not one person can tell another whether becoming a parent is the right time for them. You’d be surprised how many teen moms go on to be successful. We create a path in life and sometimes it’s created for us but that doesn’t mean we should fall when there’s a whole world out there waiting for us. Both the Mrs. and I don’t let our age get in the way of being the best parents possible. Trying to predict your future is like finding out you’re pregnant when you’ve been told it was never going to happen. Nothing short of a miracle. There really is no right and wrong time to get pregnant because you’ll always face hurdles along the way. The best advice I can give you as a 40-year-old dad to a toddler is that you’re never short on love so embrace it no matter your age. Discussion Question: What age did you have your first and last child? Did you find any significant differences? Leave me your comments below and I will respond to each and every one of them. Should students who can’t afford school activities sit out?